Dreyth was born in Blacklight, Morrowind to House Adravani, a minor house in service to Great House Redoran. Although growing up in a simple and privileged life, spending his youth in and out of corner clubs and clashing with Ordinators over his behavior. In an attempt by his family to mold him into a true Redoran, he found himself thrown into multiple conflicts ranging form Stonefalls and Deshaan to the Three Banner's War in Cyrodiil. Through these conflicts he was exposed to the reality and harshness of life on Tamriel, and was quickly forced to adopt a more responsible attitude if he wanted to survive. Upon returning home from the war Dreyth now attempts to balance his usual debauchery with the responsibility of being a Redoran soldier. This has lead him into service with House Derethi, another Redoran minor house. Alongside his new comrades he protects their interests on both the mainland and Vvardenfell. His new life has already seen conflict with the Camonna Tong and politics with other houses. Through his new house he is quickly finding new challenges to overcome, although he finds his less-serious way of viewing life and arrogance still create conflict between him and his duty he is quickly becoming a more independent warrior and respectable Redoran. Dreyth has a lean athletic build, somewhat unusual for a front-line infantryman. His developed athleticism and acrobatics allow him to use his leaner build to his advantage to outmaneuver other combatants. He sports an angular face with narrow crimson eyes underneath thin arched eyebrows. His fair falls long and silky down to his upper back, usually tied in a neat bun on the back of his head. His face is further adorned by a neatly trimmed beard outlining his jaw. Dreyth continues to have his jovial and humorous personality from his youth but with a renewed sense of purpose and gravity. He still spends most of his nights at the local cornerclub, but now he participates in debauchery as an escape from reality rather than out of idle boredom. He has enjoyed being back at home in Morrowind, but struggles re-adjusting to elitism of Dunmer society after leaving the diverse community of the Pact behind. He often uses overt sarcasm as an escape from dealing with more serious issues and always attempts to keep his fellow comrades in good spirts whatever the situation. Dreyth can commonly be seen sporting his classic Redoran bonemold uniform, the mix of chalky white bonemold and elegant red fabrics a symbol of pride in his House. Always on his hip and back are his trusty Dunmeri pronged sword and chitin bug shield. Outside of his usual militia gear he can usually be seen dressed in a classic Dunmeri nobleman's tunic and vestment, also colored in traditional Redoran red and black, adorned with ornate symbols of his house. Dreyth was born to House Adravani in Blacklight, Morrowind under The Steed in 2E 520. House Adravani was a minor house in service to Great House Redoran. They gained their fame through the manufacturing of bonemold weapons and armor, supplying them to the Redoran army. This gave Dreyth a rather privileged and simple life, growing up in Redoran’s capital with the wealth of his family afforded him a noble’s education and military training. Lacking his families talent for smithing he became a house guard for the Redoran in Blacklight, yet the strong and secure city meant he saw little combat outside the minor skirmishes with criminals and Ashlanders. This situation caused much of Dreyth’s younger years to be spent at corner-clubs engaging in debauchery and clashing with local Ordinators alongside his fellow young mer. While enjoying the finer side of life in Blacklight the Second-Akaviri invasion struck mainland Morrowind, Blacklight was spared and Dreyth still didn’t see combat, but the ravished city of Ebonheart was in desperate need of reinforcements. Dreyth’s family saw an opportunity to send him to real combat and mold him into a strong Redoran and promptly dispatched him to aid the war-torn city of Ebonheart. It was his time in Ebonheart that Dreyth first saw his real taste of battle. A local tribe of Ashlanders had been growing in numbers and was testing the exhausted cities defenses. Tensions grew quickly between the house mer of Ebonheart and the Ashlanders, soon an all out war broke between the Ashlanders and both Redoran and Temple forces. During this time Dreyth was moving constantly around the mainland between Stonefalls and Deshaan, working alongside Redoran and Ordinators alike to combat the Ashlander threat. His days commonly ended muddy and blood-soaked with his mind drifting to nostalgic memories of his simple life back home in Blacklight. 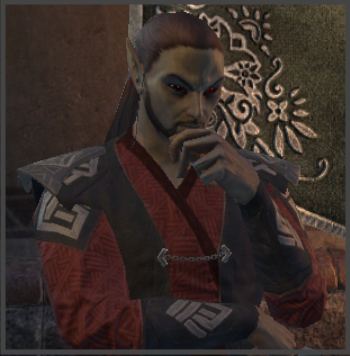 This would be far from the end of his time in battle, before the Ashlander war even ended he received a missive from his house in Blacklight, instructing him to immediately depart Ebonheart and reinforced the Pact troops in Cyrodiil. The Adravani back home had determined that the Three Banner’s war was far more important than the Ashlander conflict and the Pact troops in Cyrodiil were in desperate need of reinforcements. Dreyth’s journey to Cyrodiil was quiet and the air tense with mourning. 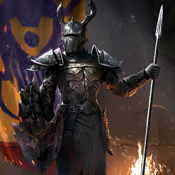 The Ashlander war may have been bloody and intense, but the troops he now marched to Cyrodiil with knew from stories they’ve heard that the ongoing battle for Cyrodiil was much worse. They arrived at the Southern Morrowind Gate and Dreyth was quickly dispatched with an infantry group of all Pact races to retake the city of Cheydinhal from a rouge Imperial Legion. For his first time fighting alongside the other Pact races Dreyth was wary, his Dunmer upbringing kept him cautious of the skills of men and beast. Yet throughout the rough conflict he found himself relying on his new comrades to save his life on multiple occasions. The Argonians taught him to better hone his lean athletic body to guerrilla warfare and the Nords became worthy drinking rivals during their downtime. Dreyth found the conflict not only improving his combat skills and strategy but turning him into the leader his house expected of him. Although the war in Cyrodiil was far from over, Dreyth soon found his service coming to an end and himself returning to Blacklight. Now back in his home of Blacklight Dreyth was finally ready to become a leader of his House. He spent a few months in Blacklight, learning the way of house politics from his kinsman and writing missives and proclamations for House Adravani. Although he found his time spent socializing in his younger years made him an acceptable diplomat his young age and newfound duty and gravity made him crave to find a new cause to serve outside the secure city of Blacklight. This lead him to hear of another minor house, House Derethi which was dealing with multiple conflicts in both Stonefalls and Vvardenfell. Dreyth quickly found himself once again on the road again heading to join the ranks of the Derethi and continue his life of service.